October | 2017 | What Next? Last Halloween we were in Saskatoon and went trick or treating with our two grandsons. It was a lovely fall evening and we had so much fun! Our older grandson was very excited about his costume and loved going door to door to shout “Trick or Treat.” I was impressed at how people in the neighborhood had gone to such lengths to decorate their homes. They were so warm and friendly to the kids that came to their doors. It reminded me of the Halloweens of my childhood. Here are me and my sister in our bunny and cat costumes in 1960. I love the whiskers my Mom has drawn on my little sister’s face and the huge bunny ears she constructed for me. Those Eaton’s of Canada bags look pretty full! We were living on Beaverbrook Street in Winnipeg at the time and so that’s the neighborhood where we will have gone trick or treating. Probably the one difference between Halloween in my childhood and Halloween for my grandsons is that my sister and I went out trick or treating on our own even at ages five and seven while all the children we saw in Saskatoon last year were trick or treating with their families. Either way celebrating Halloween still gets people out of their homes and interacting with others in their neighborhood. In a society that is becoming increasingly insular and where technology keeps us more physically isolated from one another that’s a good thing. 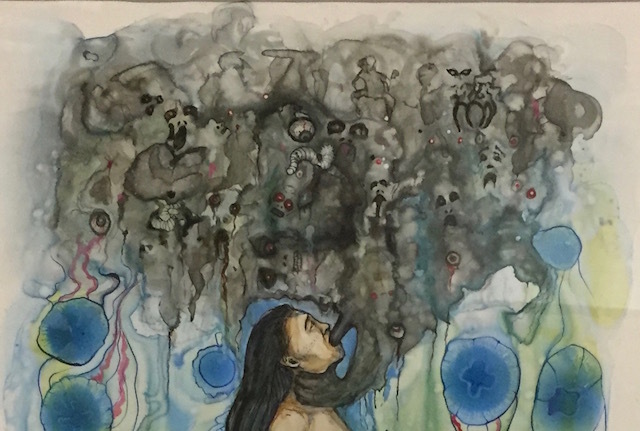 “She is gripped by terror!” A teenager on a tour I was leading at the Winnipeg Art Gallery made that comment as we looked at this ink drawing on mineral paper by Heather Campbell called Methylmercury. 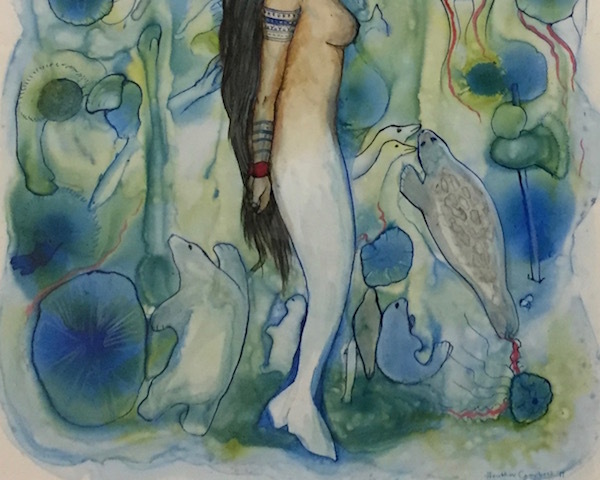 The work shows the sea goddess Nuliajuk more commonly known as Sedna. All the creatures who live in the sea were created from Nuliajuk’s fingers after a rather horrifying episode where her father cuts her fingers off. 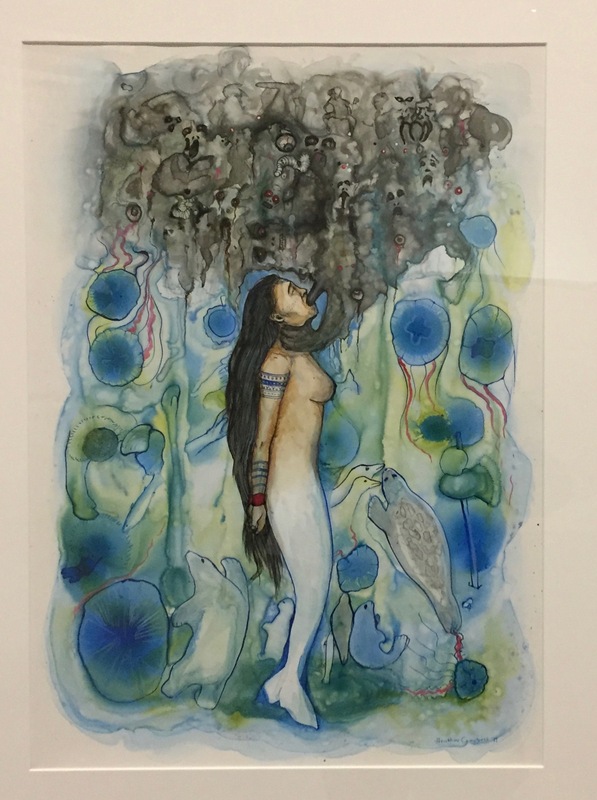 Heather says the goddess Nuliajuk is a symbol of female power in Inuit culture. Heather says the red tape binding Nuliajuk’s wrists alludes to the ongoing violence faced by indigenous women and the current inquiry about that issue underway in Canada. Heather put tattoos on Nuliajuk because traditional Inuit tattoos are enjoying a resurgence as symbols of beauty, strength, family, community and even a form of protest. Heather’s thought provoking work is one of the art pieces we will be discussing when I lead the Winnipeg Art Gallery’s Books and Brushes Book Club in November. You can read more about that here. A regular columnist for the regional newspaper The Carillon used that line this week to exhort church communities to treat their pastors with more respect and appreciation. I agree with the columnist when he says the job of the clergy is demanding and many congregants are very hard on their pastors. Interestingly an article in Christianity Today points out that church goers seem to save their harshest judgements for female pastors. Yet the Carillon columnist’s use of a male pronoun effectively excluded them. I checked to see if elsewhere in the column the male writer had used a female pronoun to describe a pastor to balance things out. He hadn’t. Language is a subtle but powerful thing. Probably without even realizing what he had done the columnist’s use of that little pronoun his excluded an ever-growing sector of the clergy. Being a pastor can be tough. It wouldn’t be for me. Kudos to both the women and men who dedicate themselves to the profession and care for and inspire their congregants in positive and hopeful ways. I walk past this art piece many times each week and have often wondered what it was called and who made it. Recently I noticed a sign on the boulevard that said the piece is named High Five and was created by Jennifer Stillwell. It is on Waterfront Drive right across the street from the Goldeyes ball park. Each of the five fins or wings or fingers in the installation are over 25 feet tall and seven feet wide. If you look at the piece from inside the ball park it looks like a human hand with five fingers. The fingers also resemble the wings of an airplane and each one has a target on it. The target designs could be abstract fingerprints, designs on an airplane wing or archery targets. Apparently during a warm up for a Goldeyes game a batter hit one of the targets with a home run ball. The artist Jennifer Stillwell said she didn’t want the piece to have a specific meaning but hoped each viewer would interpret it from the perspective of their own life experience and would be prompted to discuss its meaning with others. Jennifer Stillwell grew up in Manitoba and studied art at the University of Manitoba. She now lives in Victoria where she is a visual arts professor at the university there. Last Friday I saw the play Yellow Bellies put on by the Theatre of the Beat drama troupe. It told the story of Mennonite conscientious objectors during World War II. One scene made a personal connection for me. Rudy the young man in the play has received a notice telling him he must appear before a judge to defend his request for conscientious objector status so he can do alternative service rather than join the military. Rudy appears before the judge. 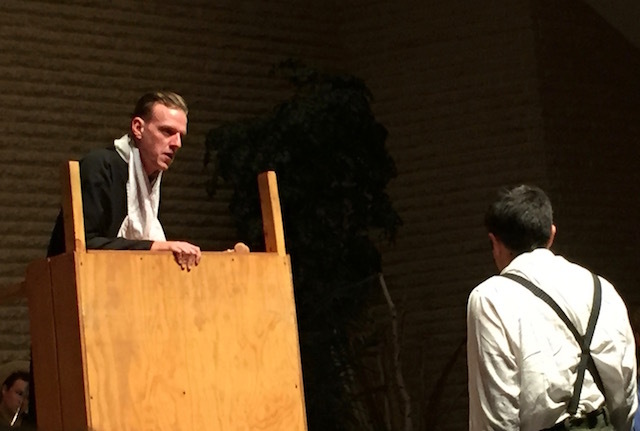 There is a scene in the play where he appears before a judge who has a reputation for being pretty hard on conscientious objectors and he asks Rudy some tough questions. This reminded me of a story my father-in-law Cornelius Driedger told me. He received a similar letter in the summer of 1942 just after he had announced his engagement to my mother-in-law Anne. Dad took his letter to his uncle and the pastor of his church N.N. Driedger who said he would help Dad fill out his application for conscientious objector status and he would go to court with him. Since Dad was a baptized member of the Mennonite Church he didn’t think he should face too much opposition. 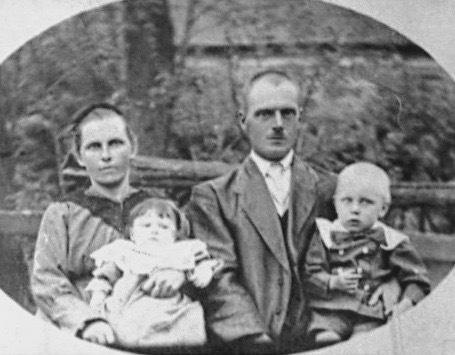 Dad’s family in 1924 when the immigrated. 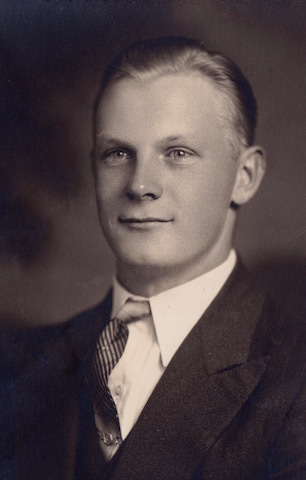 Dad had come to Canada from Ukraine with his family in 1924 and while an earlier migration of Mennonites in the 1800s had been promised automatic exemption from military service the later group of which Dad was a part had to have their cases heard before a judge. Dad’s court case went well and he received conscientious objector status . 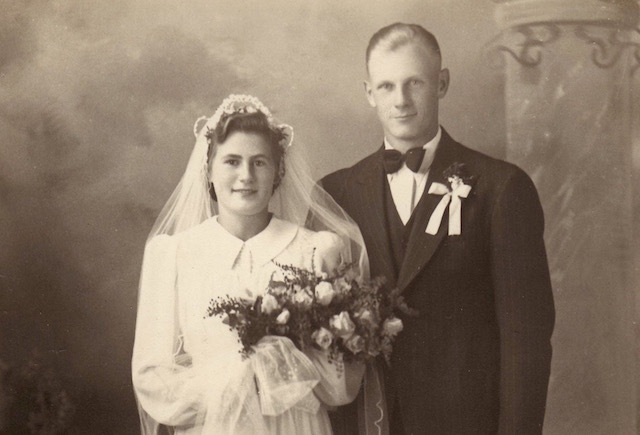 Mom and Dad had only been married for four months when Dad received word he would have to report to Montreal River where conscientious objectors would be put to work for the duration of the war by the Department of Highways helping to finish the construction of a link of the Trans Canada route. 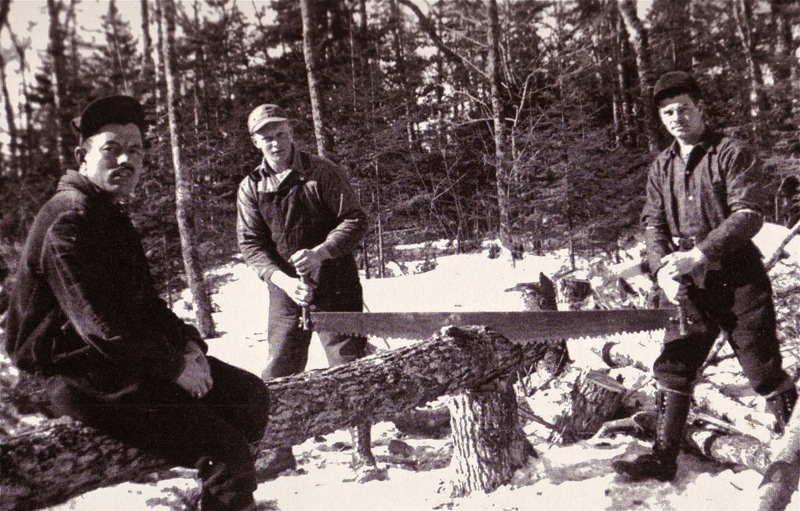 Dad in the centre cutting lumber. Dad’s job was cutting lumber to clear bushland. 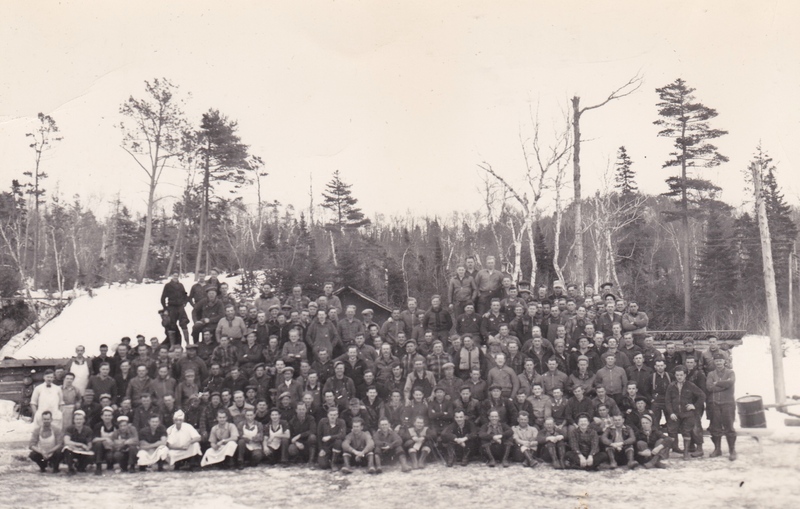 His time in the conscientious objectors’ camp was an experience Dad never forgot. You can read more about it in the link below. 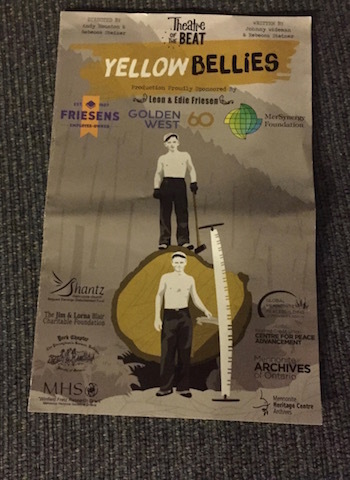 The Theatre of the Beat’s production of Yellow Bellies provided a good reminder of an important part of Canadian Mennonite history. It also brought back personal memories for people in the audience whose family members had played a role in that history. “When I was growing up we honored women.” John Kelly, President Trump’s chief of staff made that comment at a recent press conference. I think he was referencing the Harvey Weinstein case currently monopolizing media headlines. Some sixty women have accused the movie mogul of sexual impropriety. Of course Weinstein’s behavior does not honor women although the fact his female accusers are being taken seriously does. What’s remarkable about Kelly’s comment is he seems to think there was a time in history when women were more honored than they are now. And frankly that’s delusional. Kelly was born in 1950. If we look at how women were treated in the 50s and 60s when Kelly was ‘growing up’ it is abundantly clear they were not honored as Kelly suggests. 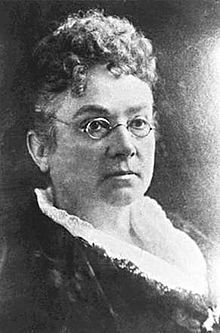 During those years women’s contributions to the work force weren’t honored because in Canada and the United States women were being paid about 60% less than men for doing the same work. American employers did not have to grant maternity leave. In Canada pregnancy was still reason for dismissal by an employer and there were no legal penalties for sexual harassment on the job. 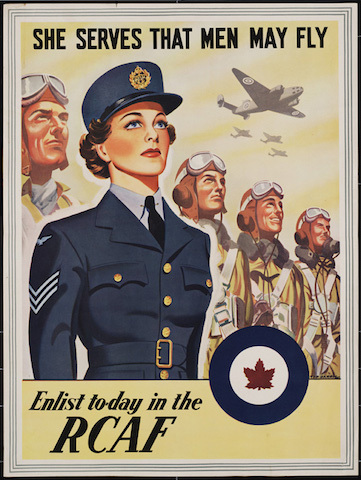 Women’s strength and courage wasn’t honored because they weren’t allowed to serve on active duty in the American military or fly planes in the Canadian Air Force. Women could not join the RCMP in Canada till 1974 and by 1980 women still only made up 5% of American police forces. 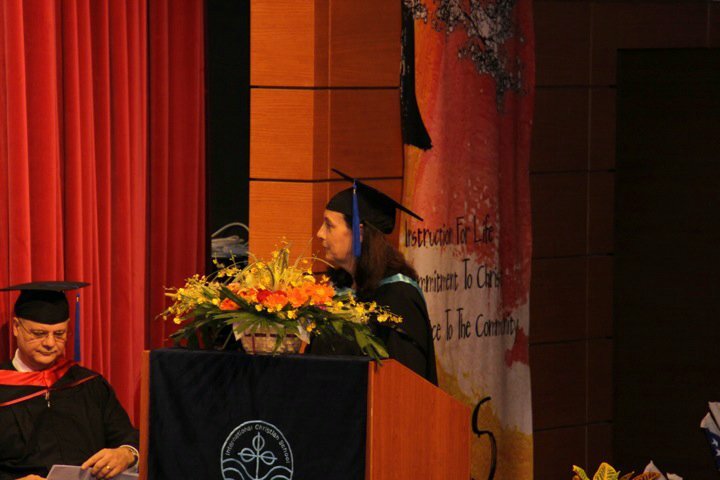 Women’s intelligence wasn’t honored because universities limited how many women could join their faculties. 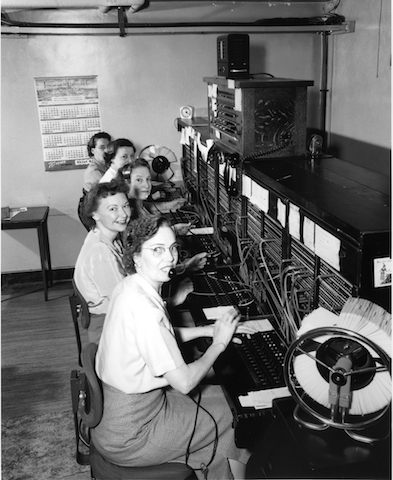 Till 1972 Harvard medical school for example had their female enrollment limited to 5% of the class. In Canada in 1970 only 14% of medical students were women. Women’s athletic prowess was not honored. 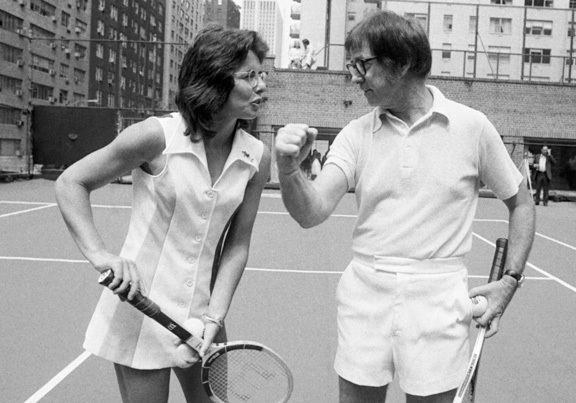 The movie Battle of the Sexes takes place in 1973 and chronicles Billie Jean King’s fight for fair pay and equal respect for women in the sport of tennis. In the 50s and 60s there were still dozens of sports in the Olympic games not open to women. It wasn’t till 1991 that the International Olympic Committee ruled any new sport entering the games must include women’s events. Women’s political contributions were not honored. In 1980 only 20 of the 441 members of the American Congress were women and only 10 of Canada’s 308 members of Parliament were women. A woman’s right to safety and protection was not honored. 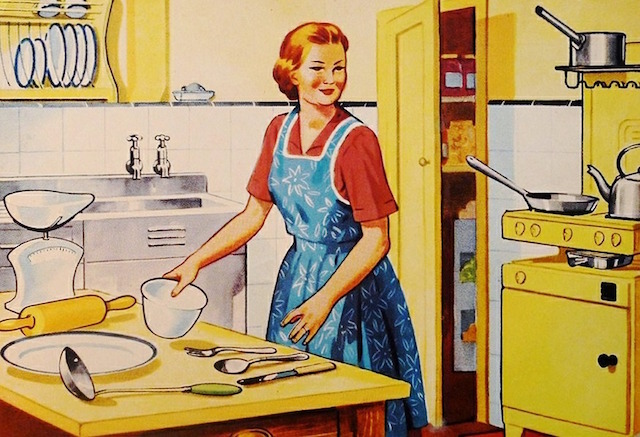 In her book Runaway Wives and Rogue Feminists Margo Goodhand says there were no shelters for victims of domestic abuse in Canada till the 1970s. The first American shelter was opened in Minneapolis in 1973. Women’s financial acumen and responsibility was not honored. 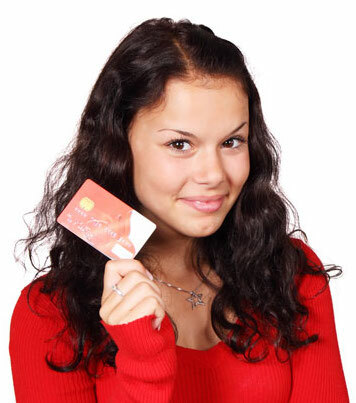 Till 1974 it was still legal for American companies to refuse a woman a credit card based on her gender. They could demand her husband’s signature of approval before granting her a line of credit. 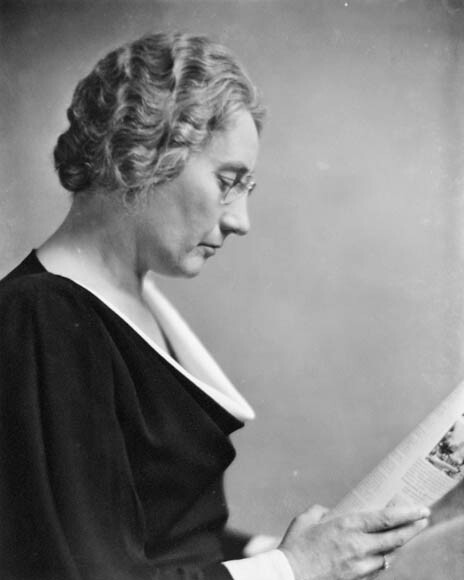 Canada’s Royal Bank only appointed the first woman to its Board of Directors in 1976. It is troubling when powerful men like John Kelly publicly extol the virtues of some imaginary time in the past when life was better for women, when they were honored. They weren’t. When men like Kelly talk about making America great again many women shudder because in the past America wasn’t that great a place for them. Canada wasn’t either. Thankfully our country has current leaders who appear to be more progressive and realistic about what it means to honor women. Kelly and his boss Donald Trump, whose track record with women is hardly honorable, might have something to learn from them. Should Women With Young Children Be Politicians? My husband and I do travel from place to place. 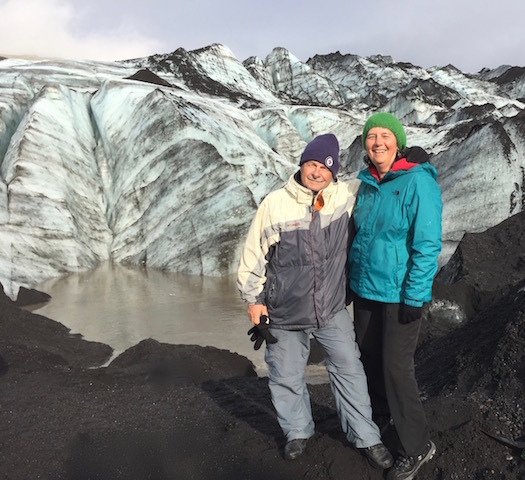 Just in the last month I have been to Switzerland, Austria, Germany, Iceland and Saskatoon. I have also traveled for work in the past as the definition suggests. 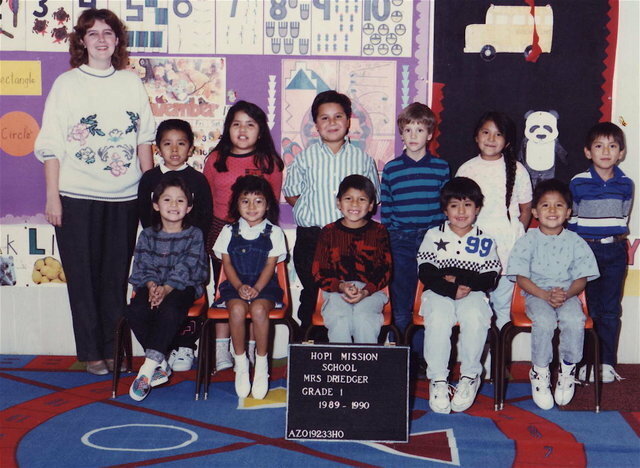 We taught on the Hopi Indian Reservation in Arizona for a year and in Hong Kong for six years. Going for a walk in southern Ontario. A second meaning of a peripatetic is someone who “travels on foot from place to place.” That could be me because I rarely have access to a car so I walk almost everywhere I go. 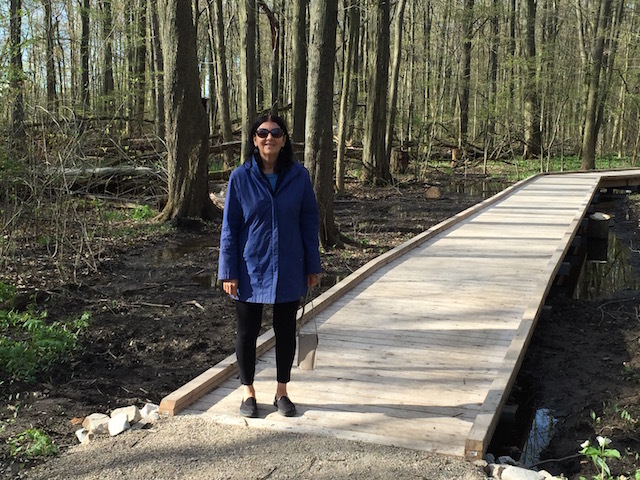 I love to walk and even when I’m traveling I like to fit a walk into my day. A third meaning of a peripatetic is someone who is a follower of Aristotle. They get this name because the great philospher liked to walk around while he lectured. I know some pastors who walk around the front of the church when they preach. That’s not me. When I am giving a talk or presentation I stand firmly behind my lecturn looking at my notes. Am I a peripatetic? I do fit two of the word’s three different definitions. So maybe I am. Is Binge Watch A Word?